One thing I'm always grateful for is the fact that I learned I should be be using eye cream at a young age and the preventative effects have paid off. Now that I'm older I don't really have wrinkles around my eyes though I do get dark circles from time to time which is vexing. Since it's a concern I'm looking to address, I'm always on the lookout for eye care products that can help to minimize them while continuing to keep wrinkles at bay. 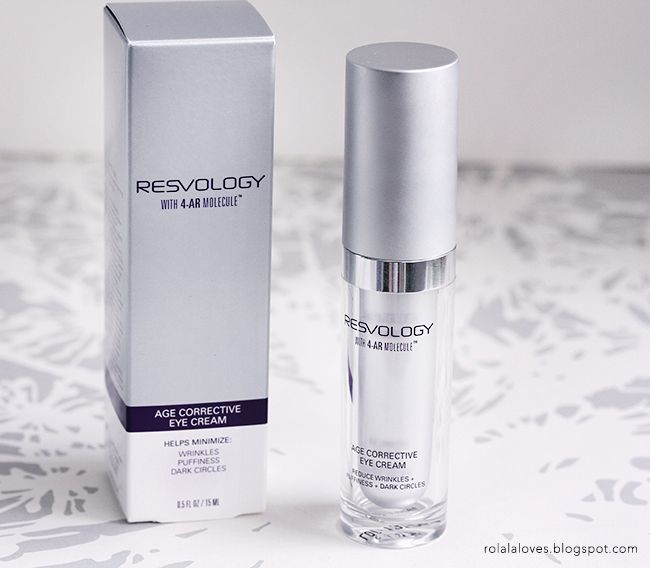 And I'm hoping that Resvology Age Corrective Eye Cream could be one that makes a difference. After all it is the 2013 winner of the HBA Global New Product Showcase "People's Choice Award" and the HBA Global "The Best of SPLASH Award". Product Claims: The Age Corrective Eye Cream is a hydrating and rejuvenating anti-aging eye cream infused with active peptides, botanicals and the multi-patented 4-AR Molecule, clinically proven to help fuel healthy gene activity by 330%. Safe for all skin types, this lightweight formula helps minimize the appearance of fine lines, wrinkles and crow's feet, improves skin's firmness, deflates puffiness and brightens dark circles. Key Ingredients: 4-AR Molecule, Targeted Peptides, Vitamins A, E and C Ester, Panthenol, Barley, Sandalwood and Olive extracts. It's also worth noting that this product is non-comedogenic, hypoallergenic, not tested on animals and free of parabens, sulfates, synthetic dyes, triclosan, phthalates and GMOs. Packaging: A sleek white and silver bottle with a pump. This is actually my preferred type of dispenser for eye cream since it's the most hygienic. It can also be easily opened so no product will be wasted when you get to the end. My Impressions: It has a nice lightweight yet emollient texture and is unscented which are qualities I usually look for in an eye cream. The cream absorbs quickly and I didn't have any irritation issues which sometimes occur when trying new eye products since my skin tends to be sensitive. I've been using it for just under two weeks now and I feel like my eye area is well hydrated and smoother as a result. I think I will have to use it for longer to speak of the wrinkle and dark circle reducing effects but I have noticed less puffiness around my eyes when I wake up in the morning so that's promising. It's too soon for me to say if I would purchase this but I would consider it if I continue to see positive results. It's a tad pricey but I only need one pump for each application. Besides I've paid more for eye cream and I'm willing to invest in good skincare as long as it works. You can learn more about this eye cream as well as the entire line of Resvology anti-aging face and body products on their website and be sure to friend them on Facebook for the latest news and promos. What are your eye area concerns? Do you use eye cream? Care to share your favorites? Disclosure: I was sent a sample of this eye cream for the purposes of this review. I was not provided any other compensation and all opinions expressed are 100% my own. Never heard of this brand before but it sounds great! I bought Clinique All About Eyes few years back as I needed to hydrate my eye area badly and have been using it ever since. It works well for hydration but as I'm developing (bad) dark circles and puffiness around my eyes I realized that I need a new eye cream ASAP. It freaks me out!! Lol. I am terribly bad with moisturizing my eyes and my neck...The two places of aging! I know I should start, but I'm unsure what to start with! I use L'Oreal under eye cream its okay. This cream sound promising and I like the packaging also its not irritated will like to try it. Great review. Perfect for this time of the years as the cold is so damaging. Love the packaging. Thanks for posting and feel free to drop by me too anytime. Great review, Rowena. I do use eye cream. At my age, I have to, although I do tend to forget to put it on lately....ack! Age corrective huh? Sounds like music to my ears :-) I started using eye cream at 22 or so. Right now I use one from Nivea. Never heard of this product, but it sounds very interesting. I will have to tested! I just may have to try this out I am looking for a new eye cream and my biggest problem is puffiness not so much the darkness or the wrinkles so I think I'm going to try this! Yes be great if you could attend lucky next year to be so fun. It's a little pricey but the packaging is pretty awesome. Beautiful review, Thanks for info!! Nice review! thanks for sharing. Also, thanks for your comment and follow. I'm following you back. Keep in touch. Have a great day! It sounds promising Rowena! Thanks for sharing your thoughts. Great review! i've heard great things about that product! I've not heard of this product but it sounds very lightweight. A very thorough and informative review! Thanks for the review Rowena! A good eye cream is definitely a good investment and it's good to hear that this works! Love the review! Let me know if you would repurchase! I'm thinking about trying it out! That sounds great - a good eye cream is such a must. great review, now i want it ! This eye cream sounds good... Great review darling!!!! I've used that eye cream before and found that it didn't do much except hydrate as well. At your age, you could probably just get away with basic moisturizer Amy. Thanks Jackie! It's a promising one. I'm pretty impressed with it so far. I've heard that Garnier Roll On is quite good. I'll have to report back on this when I've finished the bottle but I'm liking the results thus far. We started around the same time then. Well whatever you used before must've worked cause your skin looks so smooth and wrinkle free Lena. This definitely works on puffiness. You're so lucky not have darkness. You should. Thanks for letting me know Maru. I will try to do a followup when I'm done with this bottle but so far so good. yes eye cream is a must.. but i don't have one... i think i need to look for it. So far so good. Good luck finding one you like! The packaging looks posh, and the product itself sounds promising! :D I ought to be using more potent eye creams right now, but all I am using is the roller-ball one from Garnier. I'm heard good things about that Garnier roller ball but mostly for daytime use as opposed to night. I definitely like the clean elegant look of the packaging. It's one of those you wouldn't mind others seeing ;p I find adequate sleep and drinking plenty of water are just as important for dark circles as well as eye cream. I'll have to do a followup on this product after I've finished it but I'm pretty pleased with the results so far.